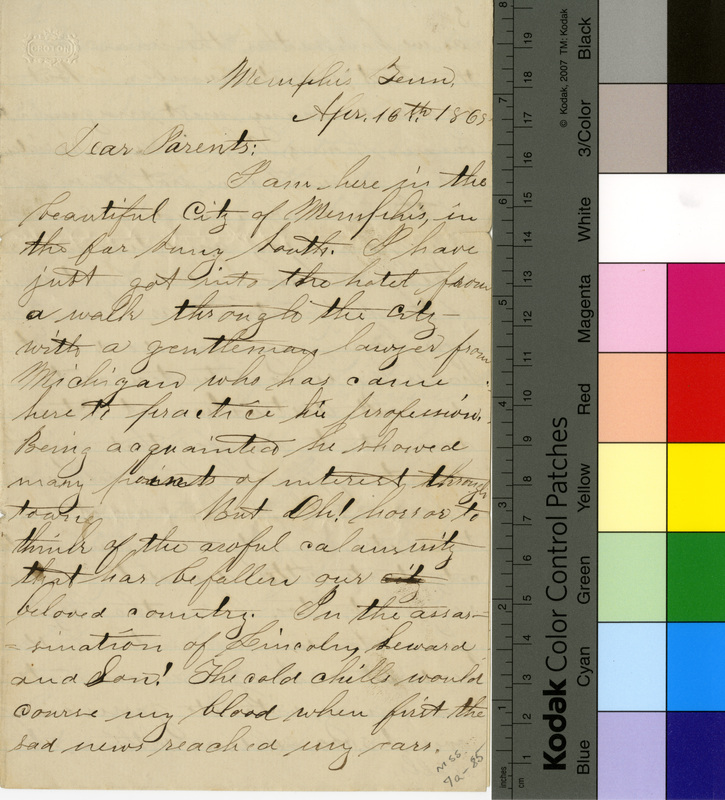 Letter to his Dear (Unidentified) Parents from their son, J. D. McClure, April 16, 1865. McClure was in Memphis (Tenn.) setting up a business. He may have been from Iowa originally. McClure writes at first about moving to Memphis and having a tour of the town. Then he abruptly and emotionally transitions to having heard about the assassinations of President Lincoln, Seward, and Son that day from the boat coming from Cairo. He writes of the flags in town being at half-mast and draped in mourning [bunting]. McClure refers to the Secessionists as demons who will be destroyed by God. He then returns to the story of his tour of town, trying to help a lady find her husband at an unknown address, viewing the strong fortifications, battery, and garrison with lots of Union soldiers, the warm temperature and advanced state of growth in the trees and vegetables compared to those in the North, and how at present he has little business. here to practice his profession. sad news reached my ears. green with grass and vegetables. how I shall like the place. from the high price of living. I guess it is dinner time. get more settled in business.